Each year, colleges and universities strive to make their institutions better places to work. To help them, the Great Colleges to Work For survey provides participants with a means to gather actionable data and insights from their faculty and staff. Participation is completely free! If you’re still not sure participation is right for your institution, here are the answers to 9 common questions we receive about participation. Q. What is the Great Colleges to Work For program? A. 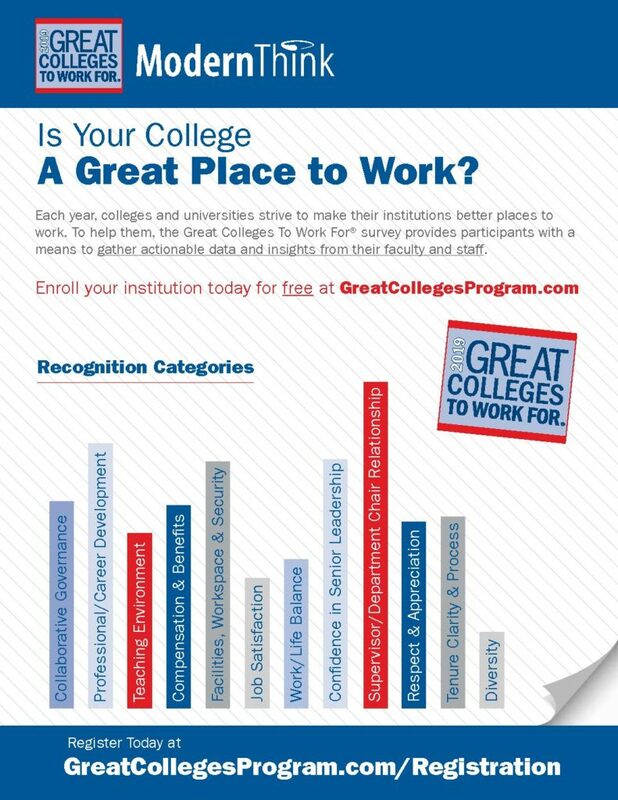 The Great Colleges to Work For program is designed to recognize higher education institutions that have created exceptional work environments. The program is similar to the popular Fortune 100 Best Companies to Work for issue, with one big difference, instead of ranking institutions in one big list, the program recognizes groups of colleges for best practices and policies, specifically collaborative governance, work/life balance, and job satisfaction. A. The survey is open to both 4-year and 2-year not for profit institutions in the U.S. with at least 500 students. A. Basic participation in the program is free. Q. When do I need to decide? A. Registration closes in mid-February, but we encourage institutions to consider this option now so they can have plenty of time to maximize participation from employees and buy-in from senior leaders. Institutional Pride: The survey provides senior-level administrators and academic leaders with insights on the quality of the workplace experience and the competitiveness of their policies and benefits. Competitive Advantage: Institutions use the recognition distinction to enhance recruiting efforts not just for faculty and staff but students too. The Employee Feedback Report: Included with participation, your institution will receive Topline Reports detailing your college’s employee responses. Also included are national benchmarks customized to your institution. Q. How are recognized institutions announced? A. The contact at each institution is notified of their status prior to the release of the recognized institutions list. Non-recognized institutions are not publicly revealed. Results are published as a special insert in The Chronicle of Higher Education. A. The process includes two surveys gathering data about each participating institution. ModernThink administers the surveys, analyzes the data, and determines the recognition. Part I – Institutional Questionnaire: Each institution completes this online form detailing some of their institution’s policies, practices, benefits, and differentiating qualities. Part II – Faculty and Staff Engagement Survey: This validated online survey is designed specifically for a higher education workplace. The survey consists of 60 statements with a five-point agreement scale; an 18-item benefits satisfaction component; two open-ended questions; and 15 demographic questions. Q. Can we customize the survey or include more than a sample of faculty and staff? A. Yes, many institutions choose to go beyond basic participation in the program to customize the survey instrument to add specific questions, modify demographics, and add additional survey takers. Our core survey, once tailored to your institution, can meet your needs around a key metric for a climate study, leadership transition, accreditation documentation, etc. Q. Who on our campus might be interested in this? A. Generally our point of contact at each institution is those with oversight of Human Resources, Institutional Research/Effectiveness or the President’s office.